Anemia is defined in the USA and Western Europe as a hemoglobin concentration in blood below a given level. This level differs somewhat for men and women, and are defined by an excellent review of hemoglobin demography by Beutler 2006 (see table below for inhabitants of the USA). For the sake of simplicity in this discussion, from this point on I will only use the more commonly used older units of g/100 ml. This eliminates the use of a plethora of possibly confusing extra formulas due to the necessary conversion factors. Anemia is astonishingly common according to a recent report of the WHO (World Health Organization) report on the worldwide incidence of anemia (WHO 2008). According to this report, the incidence of anemia in Western Europe and the USA is about 8%, in the older Eastern European countries about 20-30%, South America about 20-30%, while about 40-65% of all people are anemic in the malaria-belt of Africa and some parts of Asia. Just look at some of the figures published in this WHO report (WHO 2008). These are appalling figures! And these are just a selection of a few countries for illustration� This incidence of anemia indicates poor public health, endemic diseases, unbalanced diets and malnutrition in many countries and parts of the world. Such abysmal levels of anemia means whole populations are doomed to low levels of physical and mental activity. This is the reason many Africans and Asians were once termed "slow" or "lazy" by the peoples of Western colonial powers in the past. Of course most colonized Africans and Asian peoples were slow and lethargic - they were anemic - only no one knew it at the time! But now we do know the reason, and so these appalling statistics shown in this WHO report on the worldwide incidence of anemia become a savage indictment of government policies in many countries. Such worldwide levels of anemia limit human potential in many lands, condemning tens of millions to lives of hopeless degradation, severely limiting the development of these countries, crippling the intellectual and spiritual development these peoples, and depriving the world of the potential human capital these peoples might bring to the community of nations! But why is anemia such a serious medical condition? A low hemoglobin concentration is a serious matter. Oxygen is needed by all vital tissues for normal function, and even more oxygen is required during exertion, shivering or fever. Anemia means that a given volume of blood can carry less oxygen to all parts of the body, and this is reflected in the increased mortality figures of various conditions when the people suffering these conditions are also anemic. I have put these in table form below. 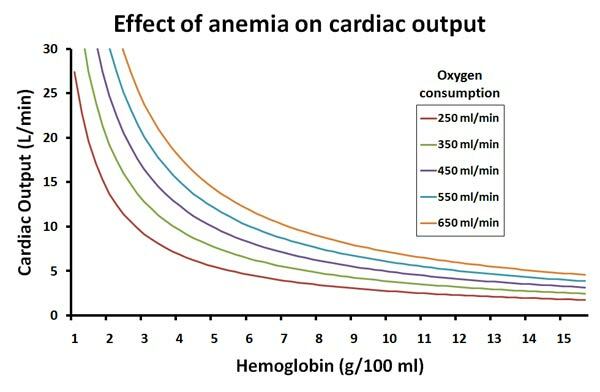 These figures are simple consequences of the reduced oxygen transport due to anemia. So how can we view oxygen transport in anemia? How much oxygen can a given volume of blood transport at normal body temperature and atmospheric pressure? So where "SO2" respresents the percent saturation of hemoglobin with oxygen, and "Hb" is the hemoglobin concentration in g/100 ml, the following formula is used to calculate the oxygen content of blood. So for example, if the hemoglobin is 80% saturated, the hemoglobin concentration is 14 g/100ml, then the blood oxygen content is = 0.8 x 14 x 1.36 = 15.23 ml oxygen per 100 ml blood. Note here that I have ignored the amount of dissolved oxygen, because the concentration is insignificant in comparison to the amount carried by hemoglobin at normal atmospheric pressures. But oxygen combined with blood is useless unless it is pumped to the tissues requiring oxygen. The heart pumps blood around the body, pumping oxygen-enriched blood to all parts of the body. If we give cardiac output the symbol "Q", and express it in liters per minute, then we get the following formula for oxygen flux, which is the volume of oxygen pumped into the body every minute by the heart. The results of such calculations shown in the curves above are revealing. They clearly indicate that all forms of physical activity - expressed as increased oxygen consumption - result in a disproportionate increase in cardiac output in anemic persons. Note that the average oxygen consumption at rest is about 250 ml/min for an average adult, and this is the lower of the family of curves in the graph above. This graph also shows that cardiac output at rest in anemic adults begins to increase exponentially when the hemoglobin drops below 7 g/100 ml, and begins to increase at higher hemoglobin levels when the oxygen consumption is higher than at rest. Actual measurements of cardiac output levels for resting adults related to hemoglobin levels, show that the above theoretical graph is real, and not just theoretical (constructed with pooled data from Brannon 1944, Duke 1969, Roy 1963). 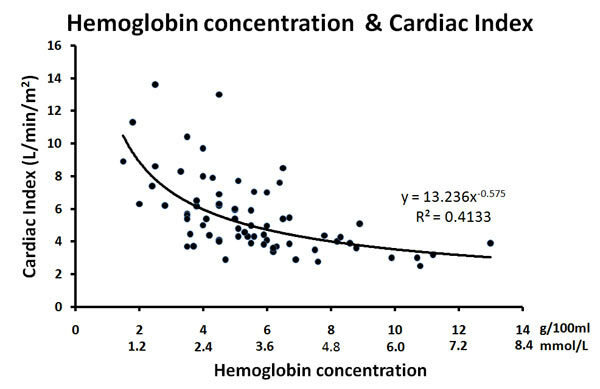 This graph of actual cardiac output measurements performed upon resting anemic adults, clearly shows that cardiac output in resting anemic persons increases exponentially as the hemoglobin concentration drops below 7 g/100 ml. The increased cardiac output required during rest in severe anemia, and certainly during exertion, is perceived as more bodily effort by people with normally functioning heart and lungs. This is why anemic people feel tired with minimal exertion. However, people with abnormal oxygen uptake due to severe lung diseases, or people with reduced heart pump function due to heart failure, abnormal heart valve function, or myocardial ischemia - these people will experience exacerbations of these conditions, which is why anemia is associated with increased mortality due to these conditions. The reverse is also true - the symptoms of anemia are exacerbated, and expressed at higher hemoglobin levels in people with reduced cardiopulmonary function. Below is a table relating the symptoms of anemia to the hemoglobin level, (based on excellent review articles by Varat 1972 and Linman 1968). Clinical signs of anemia are generally those of pallor of nailbeds, of the palmar creases, conjunctivae, and the tongue. However, these signs are generally unrelated to the level of anemia (Chalco 2005 and Karnath 2002). Anemia does not cause any problems with anesthesia, except for patients with extreme anemia who have existing heart failure, or abnormal heart valve function. In such situations, requirements for increased cardiac output due to vasodilatation due to spinal anesthesia may precipitate myocardial ischemia and heart failure. Most of the problems due to anemia are related to surgery, due to the slower wound healing, ischemia of poorly perfused regions, and precipitation of respiratory or cardiac failure in susceptable persons. This is why some people require blood transfusion during surgery. So what are the criteria for administering a blood transfusion? During the last few years there has been much discussion regarding the appropriate "triggers" for administering a blood transfusion. Certainly in this time of increasing awareness of all manner of viral infections transmitted by blood, more knowledge of the immunological consequences of blood transfusion, and increasing costs of blood transfusion, blood transfusions should only be administered when medically indicated (McCrossan 2002). One of the better physiologically based transfusion trigger guidelines are those used in the Netherlands (CBO 2005). These guidelines correspond well with the physiology of oxygen transport, and take the alterations of oxygen transport due to various conditions into account. These transfusion guidelines are given below. Jehovah Witnesses form a difficult problem with blood transfusion. They are a Christian sect with a somewhat literal interpretation of the Bible, citing a passage in the book of Leviticus in the Bible as the reason for refusing blood transfusion. 10. " 'Any Israelite or any alien living among them who eats any blood�I will set my face against that person who eats blood and will cut him off from his people. 11. For the life of a creature is in the blood, and I have given it to you to make atonement for yourselves on the altar; it is the blood that makes atonement for one's life. "Oh, say many ignorant people, but that's just the Old Testament! That doesn't apply any more..." Oh dear, how very, very wrong these people are, because Saint Paul himself reaffirmed this very God-given law in the New Testament. This is the basis for the refusal of Jehovah Witnesses to accept blood transfusions. The author's personal opinions on Christianity and religions in general are very clearly and eloquently expressed in books and websites such as The Unholy Legacy of Abraham and Mortal Minds. Accordingly, the author personally finds it ethically reprehensible as a physician to allow the wishes of Jehovah's Witnesses to dictate his medical practice where the wishes of a Jehovah's Witness are inconsistent with good medical practice. However, I am in a position of luxury, because in the region where I work there are several other hospitals willing and able to take over the care of Jehovah Witnesses. But this is not the situation for many other physicians. So what must they do? On the homepage of the Jehovah's Witnesses you can download an outstanding video entitled Transfusion - Alternative Strategies. This is actually a preview of an excellent DVD presentation made by the Jehovah's Witness organization which everyone can order. The name is inappropriate, because it should be entitled "Avoid Blood Transfusion - Blood Conservation Strategies", because this is actually the subject matter of the DVD. Likewise, the cover of the DVD box is guaranteed to induce shivers of revulsion in every atheist. However, the content of the DVD is an outstanding medical presentation of modern blood conservation techniques. The Jehovah's Witnesses organization also freely provides physicians with excellent folders containing solid and well-researched literature studies of all manner of blood conservation techniques. It's a shame these excellent literature studies are frequently ignored by the blood transfusion committees in many hospitals and countries, just because the name "Jehovah's Witness" is on the label (and this opinion comes from a hard-core atheistic humanist). This brings us to the problem of what to do with a Jehovah's Witness patient who refuses a necessary blood transfusion. As regards minors, this problem is solved in many countries, because parental rights can be instantly revoked by law in the interests of the child. Healthy young adults can sometimes survive with a hemoglobin concentration of 2-2.5 g/100 ml provided they rest, and can increase their cardiac index to an appropriate level (see graphs and calculations above). However, those persons with hypoxia due to severe lung diseases may not be able to supply thier bodies with sufficient oxygen by increasing their cardiac index. These people will simply die at hemoglobin levels as low as 2-2.5 g/100ml. People with morbid obesity, diabetic sympathetic nervous system neuropathy, people who take high dose beta-blockers, people with severe coronary artery disease, people with heart failure, the aged (>80), and people with severe heart valve disorders cannot significantly increase their cardiac index - these people will also simply die at hemoglobin levels as low as 2-2.5 g/100 ml. The Jehovah Witness organization has regional representatives who try to help their followers through difficult times in hospitals. These are dedicated people. Some are blind fanatics. Ignore them - you cannot do anything with fanatics. They only blindly parrot rigid Jehovah's Witness theology without considering the sometimes desperate and miserable human condition of the people they supposedly represent. Others are genuine friendly people who really do try to help the people they represent. They are dedicated unpaid volunteers who are profoundly affected by the sometimes desperate condition of their fellow Jehovah Witnesses, and yet have the difficult task of somehow reconciling the belief system of their sect with humanity. You can speak and reason with these people. You will often be surprised by their flexibility and helpfulness. But what if exhaustive explanations, reasoning and entreaties fail, and the patient is going to die because of their refusal to accept a blood transfusion? Then accept the right of the patient to die for their belief system, knowing you have done your best as a physician. Defeated by dubious religious beliefs, you can always take comfort in the fact that death due to anemia, is death due to brain hypoxia, and brain hypoxia can be a pleasant experience confirming all the fundamental beliefs of the dying Jehovah's Witness (see Anesthesia & Hypoxia, and also Near Death Experiences).